A blend of Jazz, Funk, Blues, and Popular music that reaches across several moods: Energetic, Wistful, Soulful, Haunting, Joyous and Funky! Featuring compositions by Eric Marienthal and Jeff Lorber, with performances by Jeff Lorber on several tracks! When two-time Grammy winner Eric Marienthal announces that it’s time to make your first album, you don’t hesitate – you do exactly that! A little under a year later, “Can’t Put It Down” hits the streets. Released independently on August 19th, 2010, it contains 10 amazing tracks. “Warm,” the lead track, is currently being promoted at Jazz radio stations across the country. Brad Rambur met Jazz and Fusion legend Eric Marienthal through a mutual friend and jumped at the chance to learn all he could from such an accomplished musician. A bond was forged and Eric stepped into the role of producer and musical director for “Can’t Put It Down.“ Marienthal enlisted the prodigious playing skills and writing talents of Jazz Fusion icon Jeff Lorber and with that, the recording process began. The first track, “Warm,” was co-written by Eric and Jeff. With Brad’s tenor saxophone weighing in on this captivating tune, a hit was born. Rambur had a hand in the composition process, co-writing four of the 10 tracks. One of them, “Danielle,” was inspired by and written for a close friend; it stands out on the CD and has received rave reviews. The album was recorded in part at the La Costa Spa and Resort in Carlsbad, with additional recording done at Jeff Lorber’s recording studio in Los Angeles and locally in Rambur’s hometown of San Diego. The launch party on August 19th was held at the beautiful La Costa Spa and Resort and hosted by morning DJ Mike V. of the powerhouse Jazz station 98.1 KIFM. The 500 or so guests enjoyed performances by Rambur and his band, with Eric Marienthal as special guest artist. When asked about working with Brad on his debut album, Eric commented: “Brad Rambur is a new face on the jazz scene with a fresh saxophone sound that’ll put a smile on your face! 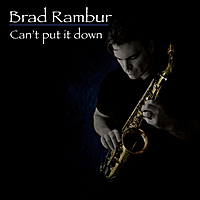 Brad’s debut album “Can’t Put it Down” showcases his broad range of style and emotion that will bring you in from the first verse!” Jeff Lorber remarked, “When Eric Marienthal called me to work on the Brad Rambur project I was excited to help him, because this was our first time collaborating to write music for another artist. I love the way our songs came out, especially “Warm,” which I think is one of my all-time favorite compositions. Brad sounds great on the track, hopefully this will be a song that a lot of people get to hear and enjoy.” It seems as though that wish is coming true as Billboard’s Radio and Records Report has him on the Smooth Jazz Indicator Most Added to radio station playlists across the US.